The OM-CP-AVS150 Series series has been discontinued. Please see the OM-CP-AVS140-6 as a possible alternative or contact our Sales Department. You can also check on the availability of any remaining stock. The OM-CP-AVS150 is a complete system used to perform autoclave validations. 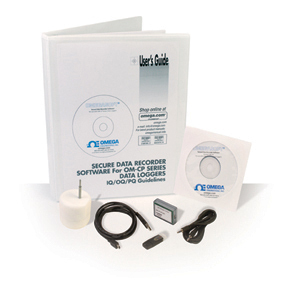 The OM-CP-AVS150 consists of a NIST traceable OM-CP-HITEMP-150 data logger, an IP68 extended range thermal shield, an OM-CP-IFC200 USB cable package and FDA 21 CFR part 11 secure software. For larger size autoclaves or mapping projects, the OM-CP-AVS150-5, includes five OM-CP-HITEMP-150’s and five thermal shields. The OM-CP-HITEMP-150 is completely submersible and can measure temperatures up to 150°C (302°F). The 51 mm (2") rigid probe provides a fast response time and can record readings as fast as once per second. The OM-CP-HITEMP-150 can be used in each autoclave cycle for verification and to provide data for validation. When used with the thermal shield the device can withstand up to 250°C (482°F) (time dependent). The secure software provides data in graphical and tabular form, and provides a summary and statistical report of the data. The software also features sterilization calculations to determine the F0 value. Furthermore the software allows for different user levels and logins, electronic signatures, an audit trail and a secure data file to stand up to auditors. This device can be started and stopped directly from a computer and their compact design allows them to fit almost anywhere. Data retrieval is simple. Plug the device into an available USB port and our easy-to-use software does the rest. The software converts a PC into a real-time strip chart recorder. Data can be printed in graphical and tabular format or exported to a text or Microsoft Excel file. 참고: Comes complete with 3.9V high temperature lithium battery, NIST calibration certificate, operator’s manual, secure software, and OM-CP-IFC200 interface cable.